Shahadra Park proposes to bring life back to part of the Yamuna River in India. Situated in-between dense urban fabric, this highly vegetated, expansive mandi creates a new ground over the drains. Courtesy of UVA School of Architecture / Brittany Duguay. The University of Virginia’s School of Architecture Dean Ila Berman recently announced her intention to launch the Next Cities Institute, an interdisciplinary design and research platform focused on the rapidly changing dynamics of global urban futures. With an aim to forecast and shape the vital urbanism of this century, the Next Cities Institute will be a university-wide initiative, led by the School of Architecture and coalescing expertise throughout the University of Virginia, with partners in its Schools of Law, Leadership and Public Policy, Engineering, and Arts and Sciences. Dean Berman spoke about the Next Cities Institute, its mission, and how it will transform the way students of architecture and its related fields will approach the design of future cities. What is the Next Cities Institute? The Next Cities Institute is a dynamic platform for design, policy, and action focused on new forms of urban research. It is predicated on our commitment to how design operates as a tool to effectively reshape the world. It recognizes that cities are our largest collective cultural artifacts, and their strategic reconception is crucial to our future. What positions have shaped the Next Cities Institute? Three critical paradigm shifts—planetary urbanization, climate change, and the accelerating transformation of information technologies—are fundamentally reshaping the city of the 21st century. The complex inter-relationships between our growing cities and their impacts, such as resource allocation and consumption, territorial migrations and informal settlements, ecological fragility and resiliency, urgently call into question the traditional planning techniques that defined much of the 20th century. The historic automobile city is increasingly unable to cope with the ways in which the city territory of the planet is being reshaped. Instant Asian megacities, new conceptions of coastal water cities, and futuristic sensing smart cities are demanding the invention of an entirely new toolbox of spatial and infrastructural concepts and strategies with which to reimagine and redefine global urban futures. How will the Next Cities Institute shape the way students at the University of Virginia’s School of Architecture engage the design of future cities? In multiple ways. We believe today’s urban challenges are inherently complex and demand synthetic thinking and making. We cannot approach these issues independently or narrowly, and the Next Cities Institute defines its research agendas across traditional disciplinary boundaries. This builds on UVA Architecture’s history of interdisciplinary collaboration that emerged from the opportunities of having architecture, landscape architecture, urban and environmental planning and design operating cohesively within a single school. The expansion of this collaboration to involve faculty and students from environmental science, cyber-physical systems, data science, law, public policy, and economics, among others, enables students to focus on real-world issues with input and expertise drawn from other disciplines that can be directly integrated into what is already a robust studio environment. The Next Cities initiative not only expands the resources of the school but also prioritizes the ways in which architecture, through its broad definition, is an active practice that operates as an agent of cultural transformation. Architecture—in its theory and physical instantiation in the world—probes the questions and controversies of the day, continually writing new expressions of the city. Our students are empowered to critically and creatively generate these new expressions, to define their own visions for urban futures, and to expand the agency of design by leading the address of global urban issues. Finally, the Next Cities initiative provides our students and faculty with exciting opportunities for integrated learning and teaching that reaches well beyond our immediate surroundings. With on-going projects in China, India, Argentina, Spain, Africa, the Arctic, and multiple national and international coastal communities, we are committed to providing students with a worldview that addresses a climate of increasing pluralism, with multiplying possibilities and points of view. Importantly, when we engage in diverse locations across the globe, we work directly with organizations and communities in situ, making the Next Cities Institute a vehicle for engagement and action through design. The Arctic Design Initiative exhibition presents the eclectic narratives of the Arctic as a dynamic, transnational, connected, and contested region. Courtesy of UVA School of Architecture/ADG. Describe a few of these ongoing research projects. The Arctic Design Group (ADG), codirected and led by Professors Leena Cho (Landscape Architecture) and Matthew Jull (Architecture) are researching the future of urbanism in the Arctic Circle. ADG was launched in 2013 and is one of only a handful of efforts worldwide to foreground design as a proactive method to develop strategies and proposals for the future of northern territories. The work of ADG is pioneering efforts in a huge geographic area—the Arctic extends over an area of nearly 5.5 million square miles. Climate change and globalization are quickly transforming this region, opening up new trade routes, and necessitating new forms of infrastructure. These transformations also must take into account the fragility of natural ecosystems and the centuries of indigenous culture that define the Arctic. This is not merely a geographical location but rather a situated set of conditions that allow us to probe how adaptability and resiliency might be central to design. ADG was recently awarded funding from the National Science Foundation’s Partnerships for International Research and Education (PIRE) grant program, making UVA’s School of Architecture part of a research team of five institutions across the United States. 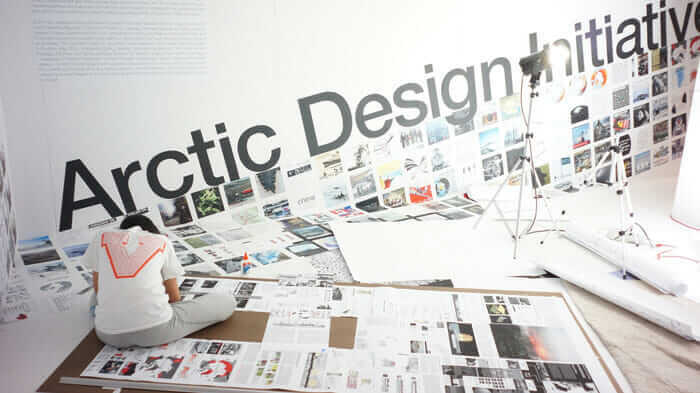 With this funding, the Arctic Design Group leads research studios that are characterizing design and urban planning within a set of cities that encompass all eight Arctic nations. We are also looking forward to the upcoming publication of work by ADG, the first of the Next Cities book series, to be published in 2018 by ar+d/ORO publishers. Another Next Cities initiative is the Yamuna River Project that frames new futures for the metropolis of Delhi in India. This is an interdisciplinary research program that examines the ways in which the Yamuna River has been a vital force of the city’s last 150 years of urban development. The project aims to revitalize the ecology of the river and reconnect India’s capital city back to the water. YRP, launched in 2016, is led by UVA School of Architecture professors, Inaki Alday and Pankaj Vir Gupta. It identifies New Delhi’s contemporary conditions as optimal grounds for the Next Cities Institute’s purpose and ambition. With a population of almost 20 million, the capital city of New Delhi relies on the heavily polluted, sacred Yamuna River. 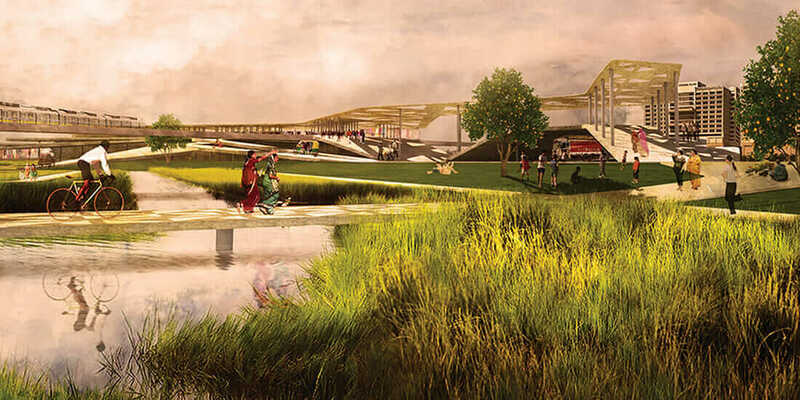 This project recognizes that for sustained remediation of the river to have effect, the complex conditions that comprise the city—social, cultural, health, economy, ecology, governance, infrastructure, and more—must be acknowledged synthetically. In March of this year, we curated the YRP Exhibition in New Delhi at the India Habitat Centre. It included faculty and student work developed through a series of advanced research studios. We presented—with the Delhi Jal Board (Water Agency of Delhi)—design strategies, research, and proposals for re-imagining the 28-kilometer stretch of the Najafgarh Drain, the most polluted part of the river, to ministry and government officials. This is the kind of engagement with leaders and policymakers that we feel is fundamental to the Next Cities Institute’s ability to have lasting local and global impacts. These are only two of our larger Next Cities initiatives. Like the metaphorical framework of urban metabolism, the Next Cities Institute is an evolving, fluid, and dynamic platform that allows our faculty, students, partners, and collaborators to study the interactions of natural and human systems within cities. With the forthcoming launch of the Next Cities Institute at UVA’s School of Architecture, we are transforming that intellectual inquiry into practice, to actively vision and create tomorrow’s global urban futures. A version of this article appeared previously on ArchDaily.